The SF Fire Department has issued a statement on what it calls “allegations being made by special interest groups” regarding the department’s resistance to sidewalk bulb-outs and other safety improvements. We can only assume the groups SFFD is referring to are Walk SF (which penned an op-ed in the SF Examiner yesterday), Supervisor Scott Wiener, and Streetsblog. An SFFD truck seen turning to avoid cars parked at a perpendicular angle in a ##http://www.ktvu.com/news/news/special-reports/tight-streets/nbKkZ/##KTVU segment## where firefighters point fingers at bulb-outs, bike lanes, and medians for slowing them down. The statement admits that SFFD Chief Johanne Hayes-White erred last week when she claimed that pedestrians are found at fault in 74 percent of crashes. “Recently, the Fire Department was provided with data related to incidents involving pedestrians and vehicles that was misinterpreted. The moment the error was brought to our attention a correction was made,” the statement says. We haven’t seen pedestrians being hit by vehicles on sidewalks because the sidewalks are too narrow. Furthermore, by narrowing city streets our vehicles and any other large vehicle traveling through San Francisco would be forced to cross into oncoming traffic to make a right-hand turn under normal circumstances. Proposals such as these cannot possibly make our streets, pedestrians and bicyclists safer. “It is a ludicrous suggestion that the Fire Department would somehow be against improving the safety of pedestrians and bicyclists,” the statement says. 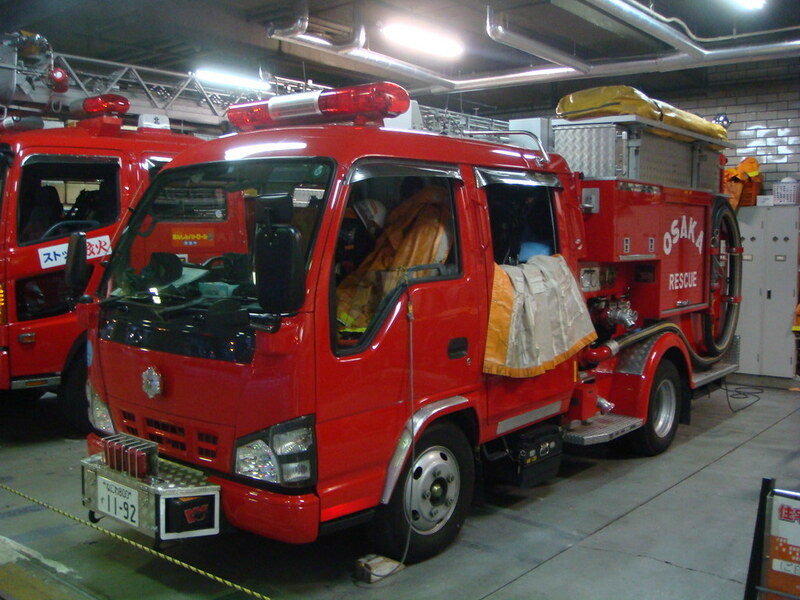 SFFD also maintains its position that road width minimums of less than 20 feet are untenable for fire trucks, saying, “The minimum width is in the Fire Code for a reason.” That reason, however, probably has more to do with the fact that state-adopted fire codes are crafted by the International Code Council, a Texas-based nonprofit, based on a suburban model, and basically copied in cookie-cutter form. Plenty of American cities use 12-foot minimums, and SF has had streets narrower than 20 feet long before it started installing bulb-outs, which typically only replace parked cars that take up street width anyway. As a reminder, the Board of Supervisors adopted a local 12-foot minimum this fall (as allowed by state law), and SFFD unsuccessfully tried to nix it. SFFD claims it “has done nothing to ‘block’ traffic calming efforts,” despite countless reports from city staffers and street safety advocates of doing just that. Notably, SFFD protests led the Planning Department to water down the pedestrian-friendly plan for a block of Bartlett Street in the Mission this summer. We believe the newly painted bike lanes with lane designators have proven to be a very effective solution to creating safer streets for bicyclists. We support ongoing efforts for improved street lighting as well. A solution that the Fire Department feels should be considered that would be at a minimum cost with the same or similar results, creating greater visibility of pedestrians, is “daylighting”. Daylighting is simply painting curb extensions. Another low cost but effective solution to preventing crosswalk incidents is installing crosswalk beacons. The ultimate goal is to improve safety for ALL and it is a shared responsibility. We need congestion pricing now! Weirdly emotion-based from a supposedly professional department. Maybe the SF Fire Chief should call NYC’s Fire Chief and listen to how NYC managed to not burn to the ground after 6 years of street improvements. San Francisco’s hidebound, conservative establishment can be so deflating sometimes. Guess we can count SFFD out in supporting wider sodewalks on Columbus since narrower sidewalks are safer. Can the mayor’s office straight fire the person who wrote this? The Fire Dept needs to get their head out of the sand ASAP. Just state what the fire dept needs in terms of turn radii and it’s concerns with compounded delays from added congestion, and let the planners and engineers do their thing. If the same logic behind the fire dept took place, they would be begging for more transit only lanes and bike lanes, both of which can double as an emergency route for emergency vehicles! Oh come on. So you mean to tell me you had your stats entirely wrong (and oh, by the way: how hard is it to actually get the right facts if that’s what you actually care about, as opposed to propagating a narrative that you don’t want to question? ), yet somehow those stats had NO effect on your decision-making process?! You got to be kidding me. This is a case of having an emotional position and trying to post-hoc rationalize it. It can be no other way, for if the data is truly informing your decisions changes, you must reassess your decision when the data changes. Of course, this would all be unbiased behavior, but the realty is the SFFD has a windshield perspective and is biased against pedestrians and cyclists and can’t actually question themselves and their decisions in a fair way. I’m pretty sick of seeing this inability to acknowledge that times change and that you need to be able to rationally and without bias reassess your policies. There are massive changes happening in our cities, and for the SFFD to act like it’s 1980 and pretend like they don’t need to reassess any of their policies, well that is “ludicrous”, to use their words. Unless they have evidence to show that 20 ft just so happens to be *exactly* the right number for street widths after much studies and analysis (and of course, there is no such evidence), then not being willing to question that number is, contrary to their stated position, working against the interest of pedestrians and cyclists. And don’t even get me started on the fact that they can sit here and nitpick on something as silly as bulb-outs when the *vast* majority of the issues effecting their response time is traffic. Why don’t I hear SFFD vehemently supporting congestion pricing? Or getting rid of parking minimums? Or increasing metering and metering fees? Not to mention doing everything possible to get people out of cars since not only do these vehicles kill and maim the most people to which the SFFD must respond, but they are creating the greatest traffic problems that limit the response time of the SFFD. If the SFFD was being rational, they would spend their limited energy on trying to change these things, not dealing with the couple times a year a truck goes up and over the curve on a bulb-out. I’m told we’re going to have someone from SFFD at our next Pedestrian Safety Advisory Committee (PSAC) meeting- Tuesday, 1/14/14 @ 6:00 p.m. in City Hall Room 400. It would be great to see Aaron and other members of the public there as we try and get some answers on these questions. Well, the one who commissioned and approved it, at least. Chief Hayes White is concerned about response times. is sounded, rather than the leisurely minute or more it now takes. Can you think of a better way to reduce response time by 30 seconds than to leave the firehouse 30 seconds sooner? If the SFFD really does have such trouble navigating city streets because sidewalks get in the way, the easy solution is to remove cars and parking. If sidewalks block access to buildings, that row of parked cars must create an even bigger barrier. The same applies for their complaint over the how narrowing streets impacts the ability to deploy outriggers for ladder trucks. If you got rid of parked cars along our streets then suddenly you have plenty of room since outriggers can be placed on sidewalks as well as on the street. Also, it’s funny that there’s no talk about how on street parking impacts the ability for firefighters to get their equipment to houses. Long term storage of large, 3,000 lb metal objects with minimal spacing between them that block access from streets to houses impedes the ability for the fire fighters to do their jobs, particular on streets where it is perpendicular or angled. Yet nowhere in the statement above is there any talk about changing the current parking policies. It just shows how politics are driving this conversation – not data. Changing parking in the city is the third rail of politics and the SFFD knows it. While I think SFFD probably does have ease of equipment movement and the public’s best interests in mind, how they’re going about it is not necessarily the most productive. Why do fire departments want us to design the streets around the equipment, instead of designing the equipment around the streets? Other countries with narrow, winding, and steep streets have solved this problem with product engineering. Why can’t we? Excellent point. As open-minded and innovative as we consider ourselves to be, too often we don’t look to other countries that are able to evolve, adapt and improve their infrastructure through the centuries. When it comes to our roads and our God-given right to drive and park where we please, it’s hard to be rational. You know, if the sidewalks were removed entirely there’d probably be room for another lane of gridlocked traffic. The only “special interest group” I am seeing is the SFFD. I implore Mayor Lee to fire Johanne Hayes-White, our Fire Chief, immediately. She is causing the SFFD to perpetuate streets that are known to be dangerous for all users. It would be bad enough if the problem was incompetence alone (we “misinterpreted” the data) but this can now only be seen as malevolence. The higher the blood alcohol content, the harder it is to keep ladder trucks inside “narrow” lanes. Things like pedestrian bulbouts will make it harder for SFFD to park in crosswalks while they do their grocery shopping. Remove the parking along Columbus, and it’s a non-issue. ✧ The Shoe Lobby is an all-powerful enterprise. Or for that matter, where is the SFFD on the issue of enforcement against double parking? 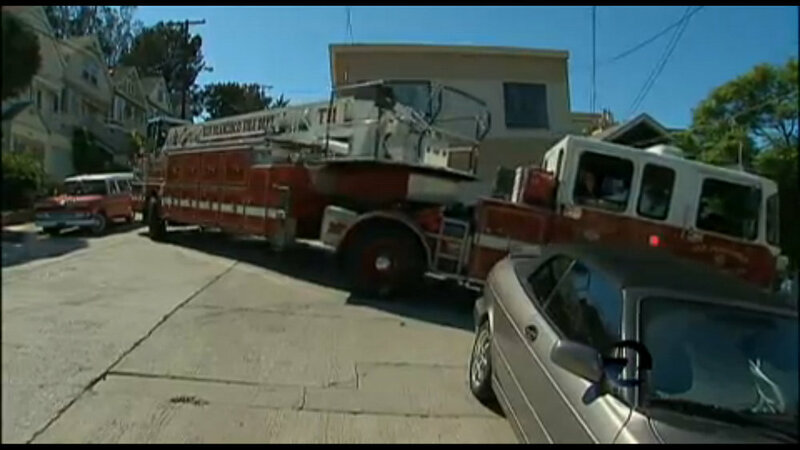 The tightest spot in that KTVU report comes trying to pass a double parked contractors pickup. Why aren’t they applying for funding for enforcement camera’s on their engines, ambulances and trucks, and increased fees for double parking impacting emergency vehicles? Specifically wrt the KTVU segment, why is it that improvements to pedestrian and bicycle safety are described as being pedestrian or bicycle “friendly” where the ingress needs of the fire department are described as a safety item, not a “firetruck friendly” issue. Call them both safety issues – they both are. REALLY: You have to be kidding. The people you are “labeling”. They are not your enemy. NIMBYS will be named and why. Who doesn’t have a job, has rent controlled apartment with garage. Rides a bike when it’s convenient. Otherwise, drives the car ,”at night, on dates, and “to buy groceries”. (So inconvenient to have to walk and take the bus)Oh, just because the 5 is around the corner . What is this, “Your personal express”. You have the time for all the meetings to city hall(that’s where the 5 passes)…SO FAR one persons initials are MH. Care to rebuttal Mike? So firefighters are actually being *maimed* (not just slowed down) by cars, yet I have never heard the SFFD once come out and demand we do something to get people out of cars. The bias and ignorance on the part of the SFFD is truly mind-blowing.